I have to start by saying that if you are a fan of Downton Abbey, you will absolutely love this story, set in a similar time frame and with similar themes. Everything about this book is epic. Take its size for a start. At 500 plus pages of smallish print, it's not your average sit down and finish it in a couple of hours historical happy-ending romance novel. Then there's the epic world period it's set in - just as the Great War of 1914 is about to begin - a time that will change the course of the modern world. On first appearances, the de Witt family seem like your average upper-class wealthy English family. But on closer reflection, their very name gives away an entirely different heritage. And one that will tear the family apart as the war takes hold. The story centres mainly on the youngest daughter Celia who is just fifteen when the story begins. Her life so far has been an easy one. She has nothing more to concern herself with than her dreams of studying at Cambridge University and her adoration of her older brother Michael who is doing just that. She envies the beauty of her older sister Emmeline, set to marry a wealthy English sir and seal the respectability of the family. She is half in love with a local boy whose status is really quite beneath her and the kiss they share in the garden has her dreaming of a future with him in it. But nothing can stop the coming tide of war. The signs that their fortunes may no longer be in favour are evident when the family host their annual village party and they are snubbed by the whole village when no-one turns up. They try to ignore the slight, but within days war comes and very quickly the family's lives unravel. From wealthy landowners, they descend into a muddled chaos of jilted love, suicide contemplation, alienation and imprisonment, deep depression, and desertion to the army. I still feel quite haunted now thinking of Celia's experience as an ambulance driver in France. I cannot contemplate the horrific sights, sounds and smells she would have been assaulted with driving men broken and near death to the nearest war hospital at seventeen years of age. Men crying out as wild animals, the rotting stench of decaying flesh and having to clean out the ambulance after each wild, terrifying ride. I cannot imagine what it would have been like for those in London, opposing the war in secret, and risking imprisonment and worse to fight and hide those opposed to the draft. I cannot imagine what it would be like to be imprisoned far from my family for the entire war just because my ancestry posed an imagined threat. I cannot imagine being so determined to prove my 'Englishness' that I might run away to join the army and yet tragically find myself incapable of giving orders to my men with awful consequences. We live in a world so removed from this one of 100 years ago. I have a feeling we don't really know how lucky we are. Whether we possess the same grit and determination has potentially never been and may never be tested. I would like to think I could have similar courage in the circumstances but until that is tested I guess I could only hope. Much as I would have liked a nice, tidy ending to this story, especially after investing so much time learning to love the characters and cheer for their eventual happiness, I'm already looking forward to the next installment in a series that will eventually take the de Witt family all the way through to the Second World War. I hope I don't have to wait too long! 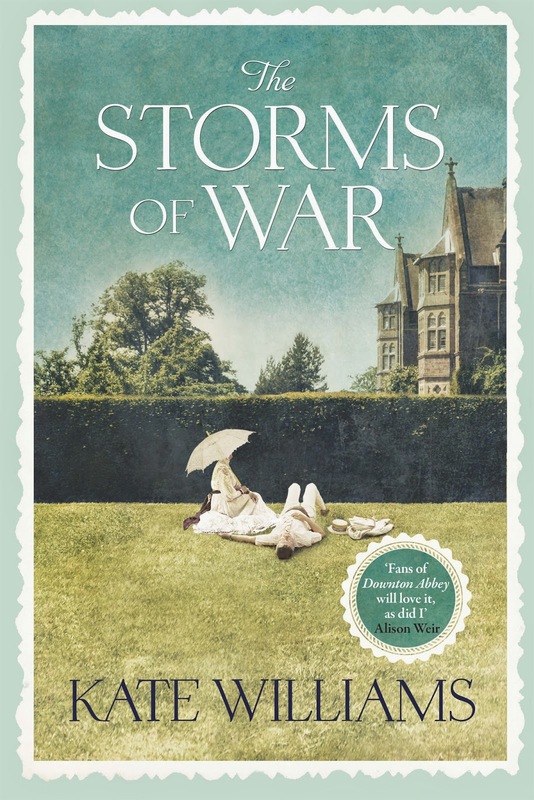 The Storms of War by Kate Williams published by Hachette NZ and available from 15 July. Disclaimer: I was given a copy of The Storms of War in exchange for my review. I am not being compensated in any other way.